So what do you do with a rather expensive Cisco brick besides throw it at well deserving users? Well, you’ll need a couple of things to pull off this miracle – first, a really large cloak**…nah, only kidding, but you will need firmware files. Yep, head on over to cisco.com and locate the firmware files for your phone model. You are looking for the individual files versus the .cop file for CUCM. In my case, I had a beautiful 7945 brick, so I downloaded cmterm-7945_7965-sccp.9-3-1SR2-1.zip. You will also need tftpd32 or tftpd64. I guess technically you could use any tftp server application, but this one is free, easy to configure, and I know it works. All you need now is to build yourself a little network island using a stand alone switch and some patch cables. 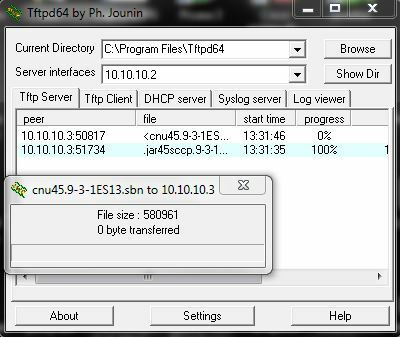 You will need to provide a DHCP address to your phone with the option 150 set to the IP of your laptop. I used a small layer 3 switch that I could configure a DHCP pool on. *wonkiness: the term a voice engineer uses to explain the unexplainable behavior of a device that is configured correctly but is clearly possessed by an evil spirit with an extremely vindictive sense of humor. **Not surprisingly, another Princess Bride reference, just go watch it already. ***Should you forget or not realize what directory your tftp server is set to serve up files from, and yes sadly I am speaking from experience on this one, you can buy yourself a clue in the form of a Wireshark capture. You should see the file being requested in the capture. If you are seeing a request like the one below, then check the location of the file. If not, check your DHCP bindings and confirm the phone is getting an address with the option 150 set. You probably already know that Cisco isn’t alone in these problems. I’ve had quite a few Avaya IP phones that I’ve had to beat with a CAT5e cable to get working. 😉 And as you point out, factory resetting can usually provide a quick fix but occasionally additional rituals can be required. +1 (if I could) for the Princess Bride reference to the Armageddon (outa here) cloak – though no mention of a wheelbarrow I note. Our corporate IP phones (Cisco) annoy me because I now need to remember to log into my phone before it knows who I am. You’re a phone – I only need you for two things: making and taking calls… sigh – where’s my mobile.. I set up “tftp64” providing a tftp and a dhcp with opt. 150 for my 7911, I want to upgrade the phones to sccp.8-5-4S, I placed the XMLDefault.cnf.xml with the correct Firmware entry and IP address of my laptop in the same folder of the firmware files. The phones obtain an IP, asking for the term11.default.loads, but the get a checksum fail, I saw that in whireshark, does somebody had the same problem yet?